OCD is extremely treatable with cognitive behavioural therapy (CBT), which is widely recognised as the gold standard treatment. Tragically, researchers have estimated the average OCD sufferer waits 11 years before getting treatment. One reason many people don’t seek help is because they don’t realise they have OCD. ‘When I started checking doors were locked seven times a night, making sure every switch in the house was turned off, and sticking to rituals to feel in control, I dismissed comments that I might have OCD’, wrote Metro journalist Ellen Scott in the wake of the KHLO-C-D controversy. ‘People with OCD are clean and organised, I thought. My room is nearly always a tip and my bag is littered with receipts. Because I didn’t fit what I thought OCD looked like, I didn’t speak up about those symptoms. I didn’t get diagnosed quickly, I didn’t get help, and I’m still working out how to cope with obsessive thoughts when they come up’. Ignorance about OCD – both the nature of the condition and how best to treat it – extends to professionals. Half of OCD cases are misdiagnosed, according to a 2015 survey of American doctors published in the Journal of Clinical Psychiatry. Many psychotherapists, too, are uninformed and inexperienced in dealing with OCD. One German study found the vast majority of respondents (87 per cent) ‘estimated the treatment of OCD as being of no relevance or only of little relevance in their daily practice’. Less than half used exposure treatment – the most important part of OCD therapy. Ignorance is especially marked in cases of pure O, a form of OCD characterised by intrusive thoughts (“what if I hurt a child?”) but no obvious behavioural compulsions. (To spread awareness, I hope to devote a future column exclusively to the problem of intrusive thoughts in OCD). I’m not surprised by the research findings. I’ve worked with people who, after telling their previous therapist or doctor that they had an irrational fear of XYZ, were then advised to avoid XYZ so their anxiety would be minimised. However, avoidance is never – never – the answer. This is the worst advice an OCD sufferer can possibly get. Exposure is the opposite of avoidance. It means you face your fears until your anxiety subsides. For example, someone who fears germ contamination may be asked to first touch a doorknob in the therapist's office, before moving onto more intense fears (touching things handled by many people in public places, touching doorknobs in public bathrooms, etc). All forms of OCD demand exposure treatment. You can talk about your problems until the cows come home, but if you don’t expose yourself to your fears, then your OCD will persist. It’s maddening. 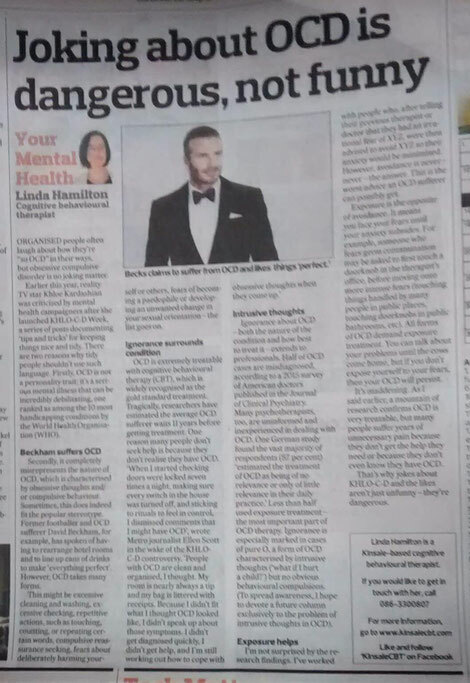 As I said earlier, a mountain of research confirms OCD is very treatable, but many people suffer years of unnecessary pain because they don’t get the help they need or because they don’t even know they have OCD. That’s why jokes about KHLO-C-D and the likes aren’t just unfunny – they’re dangerous.